Ricky’s notion of “free” is questionable. Earlier today, Consumerist reader Steve popped into Ricky’s — a chain of stores in NYC — to pick up some of his usual pomade. On the shelf, he saw what initially appears to be a good deal — a free travel-size shampoo with the purchase of a tin of pomade. But something struck Steve as being off about this deal. The package with the supposedly free shampoo (actually a 3-in-1 shampoo/conditioner/body wash) had the price tag of $24, much higher than Steve was used to paying. “I thought that was a little pricey, so I asked if they had the pomade by itself,” he writes. 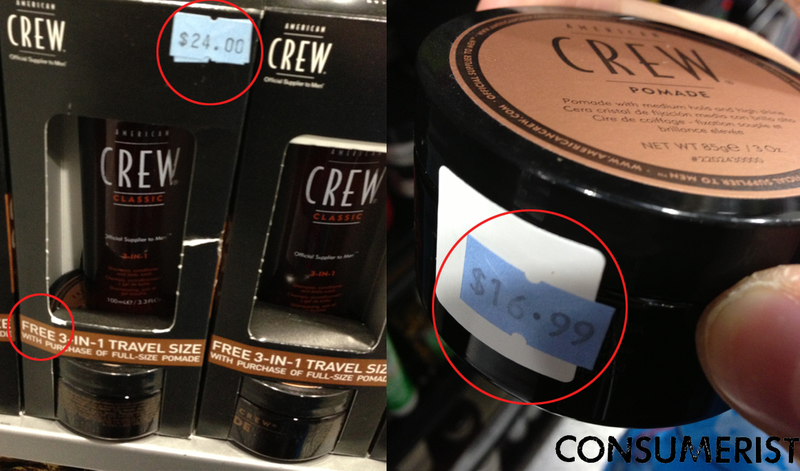 A Ricky’s employer found some pomade on another shelf that was only price at $16.99. It was the same exact product as what was in the $24 packaging. Steve says the employee even pulled one tin out of the more expensive box so they could compare to make sure they identical. It’s also possible that this is a bona fide unintentional pricing error, but regardless it’s a reminder to not automatically assume that just because the packaging says something is “free” that you’re getting a better deal. You need to be even more vigilant when you’re doing a lot of shopping at once. If you’re cart or basket is filling up and you’re just grabbing things you buy on a regular basis, it’s easy to overlook a mis-marked (or marked up) price tag, and those few dollars are less obvious at the cash register.